Hey guys, Kris here with the latest Pokemon News, today the Pokemon Company announced 3 brand new Pokemon titles coming to the Nintendo Switch, here's everything we know so far. "Grab your Nintendo Switch and get ready for a new adventure! With Pokémon to befriend and hidden treasures to uncover, #PokemonQuest is a brand-new land for you to explore! The Pokémon in Pokemon Quest were originally discovered in the Kanto region—but this time, they have a boxy, cube-like appearance! Pokemon Quest allows Trainers of all ages to get in on the action! In this free-to-start game, you can face off against wild Pokémon and embark on many exciting expeditions. In Pokemon Quest, you get to decide which characteristics your Pokémon will have! You can use special items called Power Stones to strengthen your team. The kind of Pokémon they become is completely up to you! Pokemon Quest takes place on the mysterious Tumblecube Island, which is known to be filled with hidden treasures and special items. With a team of up to three Pokémon, you can explore the secrets of Tumblecube Island. Battle wild Pokémon, gather treasure, and even befriend new Pokémon—if you have the right ingredients, that is! Pokemon Quest puts the power in your hands." 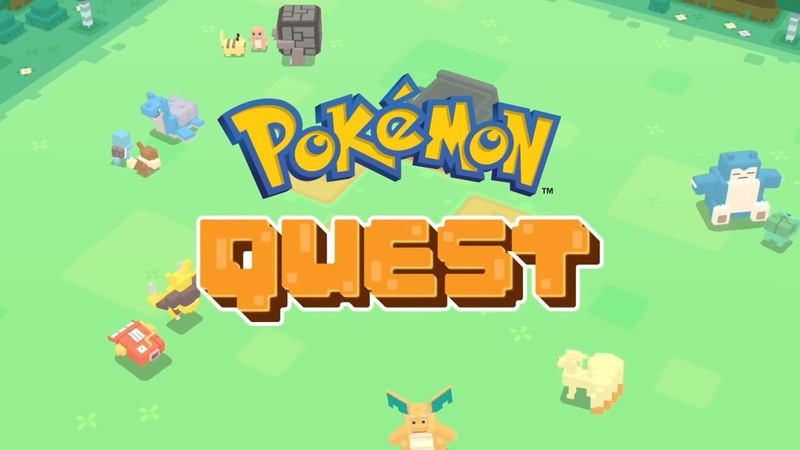 Pokemon Quest is a spin off game that looks similar to the Rumble series from my observations, it looks interesting for casual players, so if you like the crazy gameplay of Rumble, Quest might be for you, coming June 2018 for mobile, and released today on Nintendo Switch. Get ready to explore Kanto once again in this brand new journey, a reboot of the beloved Pokemon Special Pikachu Edition for the Gameboy, Pokemon: Let's Go introduces us to 2 new protagonists, and the starter options of Pikachu and Eevee, depending on which game you pick up. Your starter will always be with you, on your shoulder, your head or beside you, throughout your journey. In a series first, two players can play simultaneously using one Nintendo Switch and two Joy-cons, using eachother's help in Battles, Catching Pokemon and more. Catching Pokemon is taken directly from Pokemon Go, in that Pokemon will be encountered in the overworld, and catching them just like you would in Pokemon Go. There will be no wild Battles, but Pokemon Gyms will return in these titles. If you have Pokemon Go, you can connect it with Let's Go to recieve Pokemon you've caught in Go. A special Pokemon will join your journey in this new title -- A Pokemon never seen before. Pokemon: Let's Go, Pikachu & Eevee release November 16 2018 for the Nintendo Switch. Expect a discussion post about Let's Go up soon, talking more in detail about these new games. When I first heard Pokémon Quest I thought about conquest, but my hopes were quickley stomped on. If I even buy LG:Pikachu or LG:Eevee Id want Eevee just because I like Eevee more. I'm going to be honest. When I saw the catching mechanic, I cringed. (May 30, 2018, 01:34 PM)moo311 Wrote: I'm going to be honest. When I saw the catching mechanic, I cringed.